Automobile dealer profitability is under pressure in this era of reduced sales volumes and highly competitive pricing and dealers across the country are seeking ways to improve profits and add value to the new and used cars. Many find that paint protection film is valued by car buyers and adds to the bottom line. This clear film replaces bulky vinyl bras and plastic deflectors and helps to keep hoods, bumpers, door posts, fenders, and mirror backs looking new longer. Even those leasing a new car find value in PPF because the appearance of the vehicle is better preserved, thus reducing the potential for assessed penalties at the end of the lease term. Why should a car dealership offer 3M Paint Protection Film to its customers? 3M Paint Protection Film is a great revenue enhancer that can generate $300-$500 in gross profit per car. PPF can contribute $125,000 to the bottom line of a car dealership which sells 250 cars per year. In addition to being a revenue generator, PPF can also enhance your CSI ratings. Post-sale rock chips are major complaints among new car buyers, thus driving down a dealership’s CSI. PPF will minimize these complaints. You can perform the installations in-house or subcontract labor to a 3M Certified Installer. What do car dealerships say about 3M Paint Protection Film? “We have the typical road hazard problems of winter-time salt and gravel on our Kansas City streets as well as bug stains and acids in the summer months,” said Parts Specialist, Miles McBroome, Superior Lexus, Kansas City, MO. “Our customers are pleased with the performance of the film and they must be telling their friends because owners of other makes of new and used cars are coming into our dealership and requesting that we apply the film to their vehicles,” he said. Lexus of Glendale, a large dealership in Glendale, CA, installs paint protection film on its entire seventy-five vehicle loaner fleet to protect cars from road damage and also to give loaner driving customers an opportunity to see the film in place and in action. Hopkins Honda of Hopkins, MN estimates that twenty percent of its customers opt to have paint protection film installed. Learn how to make a lot of money with very little effort. 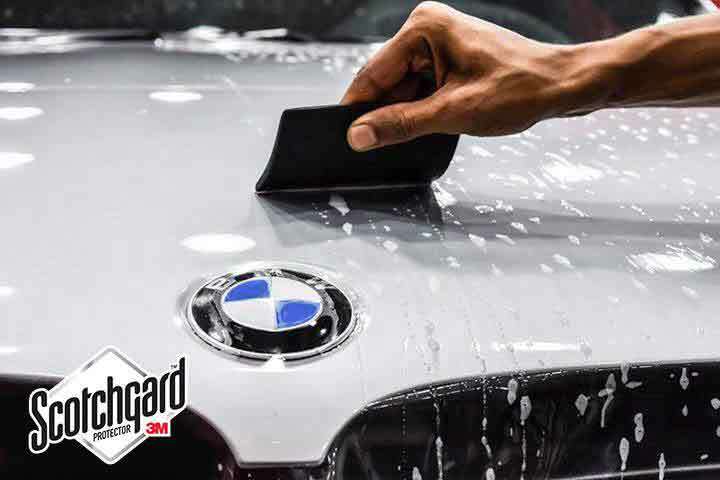 If you want to learn more about our Scotchgard Paint Protection Film program for dealerships, please contact us.